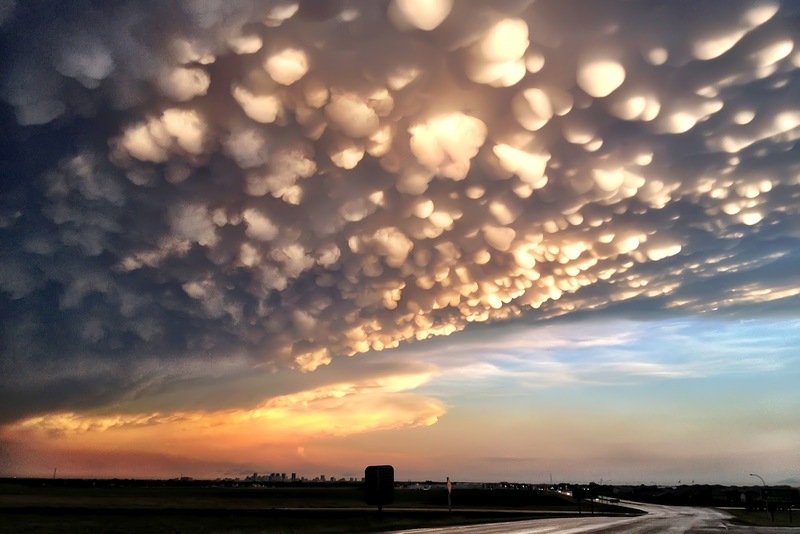 Mammatus Clouds! – It Works For Bobbi! Published on June 28, 2012 August 9, 2016 by Bobbi-Jo G.
According to Wikipedia: “When occurring in cumulonimbus, mammatus are often indicative of a particularly strong storm or maybe even a tornadic storm.” In our case, a tornado had touched down just a few kilometers out of town and we experienced perhaps the most severe thunderstorm I can remember. I guess the conditions were perfect to create these cool clouds extending over the entire city. It was magnificent to behold! And now you know what Mammatus clouds are! LOL! Previous A First For Me! Next Free Friday! Simple As That Canada Day Round Up! Yikes! They look rather scary. I think I would of been freaking out wondering if we needed to escape from a tornado or not. VERY COOL photo! Good job Lyndon! These clouds are incredible! What an amazing capture – thank you for sharing! Thanks Lynn, you can check out all the pictures I took on Facebook. You might have to use your kids account though. I only wish I had Bobbi's camera for the shots instead of my iPhone. Very cool. I have never seen these, so thanks for sharing. Amazing capture and good to know!